If you’re an elite level lacrosse player looking for a new helmet, you might want to consider the STX Stallion 500 lacrosse helmet. Designed for players who want top notch protection for their head, the STX Stallion 500 helmet offers a ton of great features. To start, STX teamed up with Schutt to make the Stallion 500 helmet. Schutt brings to the table many years of respectable football helmet manufacturing, and is now assisting STX as they create their first line-up of lacrosse helmets. The STX Stallion 500 lacrosse helmet is constructed with an ABS (Acrylonitrile Butadiene Styrene) Shell which uses impact modifiers in it’s protection system. The Stallion 500 helmet is designed to withstand football impacts, which are typically stronger than lacrosse, meaning this helmet can take a beating and still protect you. STX’s helmet also uses D30 technology which is a shock absorbing material that can react differently and appropriately to different types of impacts. Additionally, they’ve added a TPU or Thermoplastic Urethane padding system in the high impact zones in order to improve protection. Inside the STX Stallion 500 helmet you will also find a SureFit Air liner. This air bladder system allows you to add to remove air from your helmet for a more comfortable fit. At the end of the day, if you’re looking for a new lacrosse helmet and want to try one of the best that’s out there, you should be looking hard at the STX Stallion 500 lacrosse helmet. Ready to pick up the STX Stallion 500 helmet? You can grab yours today through Amazon and get free shipping with Prime. Click here to check it out! 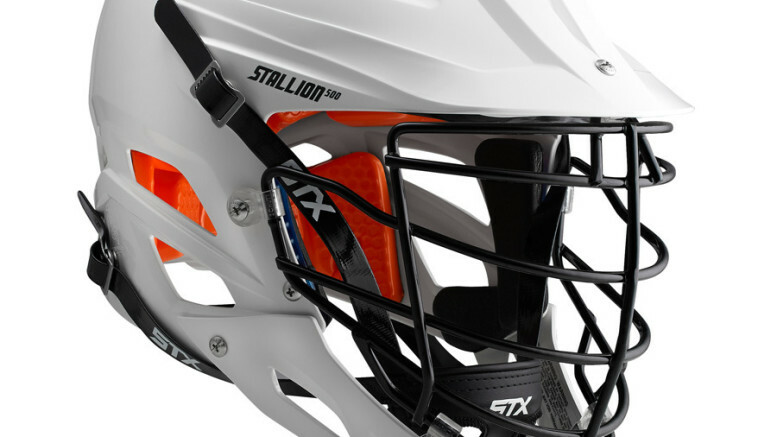 Be the first to comment on "STX Stallion 500 Lacrosse Helmet"